David & Jan Laugher - a world away from today and proving we can actually walk on water. 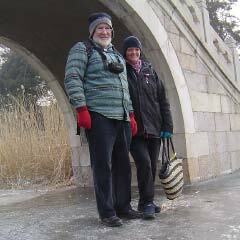 We are standing (just) on a frozen lake, Tsinghau Uni, Beijing, Jan 05. After years of living a fairly normal life – work, raising 2 magic children, etc – we have read the signs. We have decided to jump off the deep end, to become grey nomads; thereby fulfilling a long-held dream. Our businesses in Moruya have been sold and/or shut down. Anything that is not going on this journey with us is being sold. All that is except for photos, family keepsakes and the like that are being stored at a mates place. Our only plans are that we will be heading north, and we will work when we can find it. We both can’t wait for the journey to begin early in October 2008. For now, preparations are going to plan. 16 Oct 08 Update – yes, our plans are progressing well. A couple of weeks delay in picking up our van is but a small glitch in the rest of our lives. We are heading to Melbourne next week as the van will be ready just in time for my younger brother Tim’s 50th party. Final auction of furniture, etc set for 8th November, hand house keys back on 10th November and then we will be hitting the road. First stop Canberra to visit no. 1 son, sister Christine and family, and niece Cherie and her family. Then we set the GPS for a northern direction.